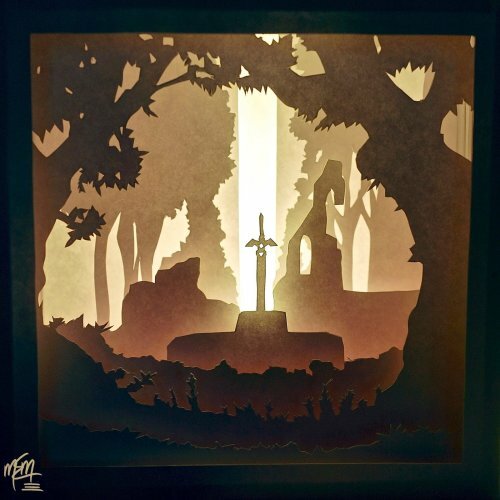 Papercraft lightboxes are similar to Japanese tatebanko dioramas. Tatebanko dioramas create depth by spacing layers of paper cutouts inside a paper box. Lightboxes make of use the same layering technique, but add a light source behind the diorama to further increase the sense of depth in the scene. Otaku Crafts has created a series of papercraft lightboxes based on Studio Ghibli movies and video games. Pictured is a diorama containing the Master Sword from the Zelda video games. The template for this and other lightboxes may be downloaded from Otaku Crafts' webpage here. In 2010, I released a tatebanko-like paper theater that could, at least in theory, be modified to become a light box diorama. An image of the finished theater and a download of the template may be found here. 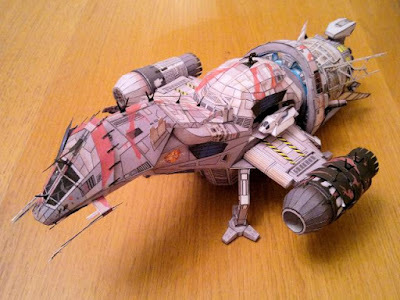 This detailed paper model recreates how the starship Serenity appears near the end of the 2005 Serenity movie. 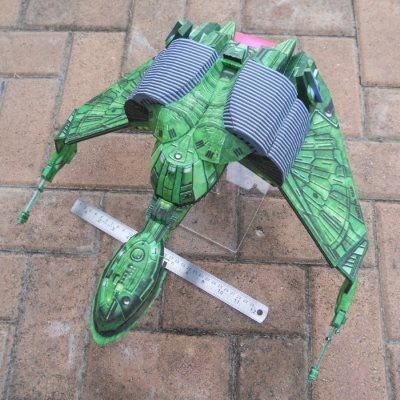 The crew of the Serenity, in order to sneak through a Reaver flotilla, disguise their ship to look like a Reaver ship. Reavers might best be described as uber-violent, cannibalistic space pirates. The model was created by Laz who modified an older Serenity model by Jorge A. Garcia. The template and instructions for the model may be downloaded here. A smaller, simpler, non-reverized Serenity papercraft was previously posted here. The papercraft family tree has many branches. One branch of which I only recently became aware is the art of paper cutting. Typically, papercut art is 2d and looks like lace. 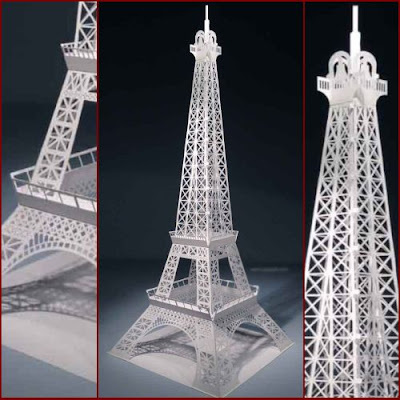 However, some artists, using the same cutting techniques, build 3D paper sculptures. 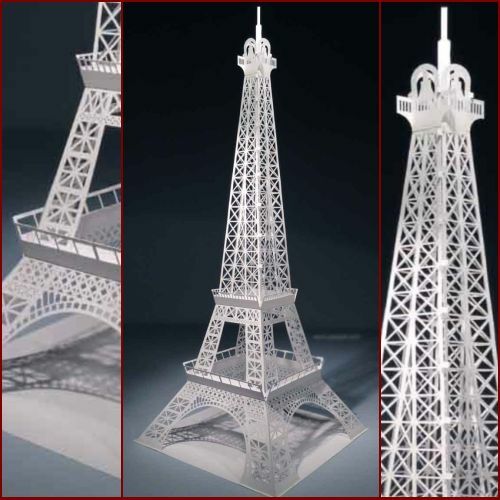 This model of the Eiffel Tower is one such example. The tower was designed by an artist from Vietnam known only as Yee. As cutting is my least favorite part of building paper models, I doubt I will be trying this model any time soon. ;) If you are braver than I, the pattern for the tower may be downloaded here. The Eiffel Tower has graced the center of Paris since 1889. The acronym "humvee" is short for "High Mobility Multipurpose Wheeled Vehicle". Since the early 90's, Humvees have largely replaced the Jeep as the primary light tactical vehicle of the US military. 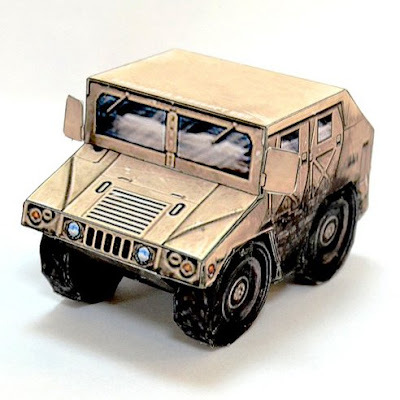 This super deformed humvee paper model is the work of Christopher Ryan M Suryanto. It is his first experiment with super deformed papercraft. Nice work! The template for the model is available here. It has been a while since I posted any paper models based on the Elder Scrolls V: Skyrim video game. 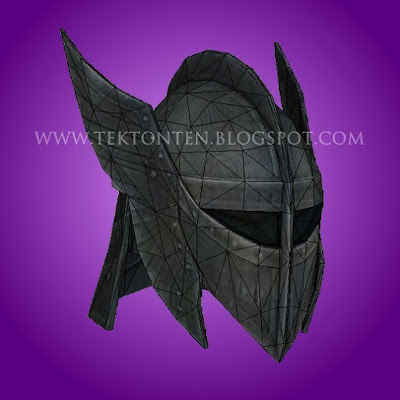 This life-size Steel Plate helmet papercraft was created by DeviantART member Kurado3. According to one Skyrim Wiki: "Steel plate armor is a medium-quality heavy armor that is better than Dwarven but not as good as Orcish." The Pepakura PDO template for the model may be downloaded here. 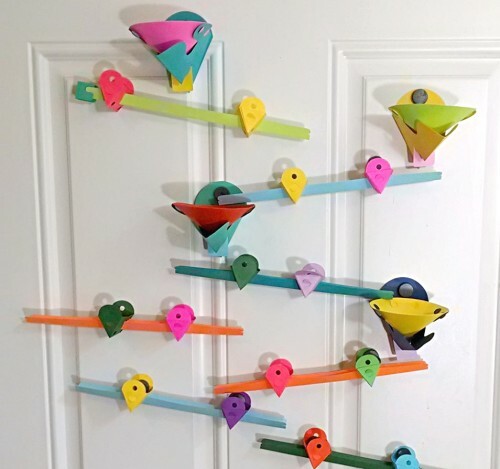 Artist Andrew Frueh describes his papercraft Ball & Ramp system as a "folded-paper rolling ball sculpture toy". Rolling ball sculptures are a form of kinetic art that make use of gravity to roll small balls through a series of ramps and other contraptions. Frueh's glue-less system makes use of three basic components: a ramp, a cone, and a basket. Free PDF templates for the components may be downloaded from the Ball & Ramp website. As Ball & Ramp is an open-source toy, it will be exciting to see how the toy grows and evolves with input from creative people around the world. 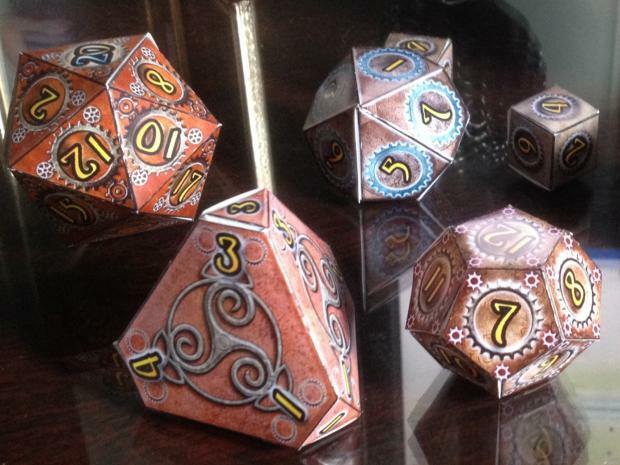 These papercraft gaming dice were created by Aaron at the DM's Craft forum. As you can tell from the gears and such decorating the dice, Aaron is a fan of all things Steampunk. Printable templates for the dice may be downloaded here. Included in the download are a D4, a D8, a D12, a D20, and four D6 dice. 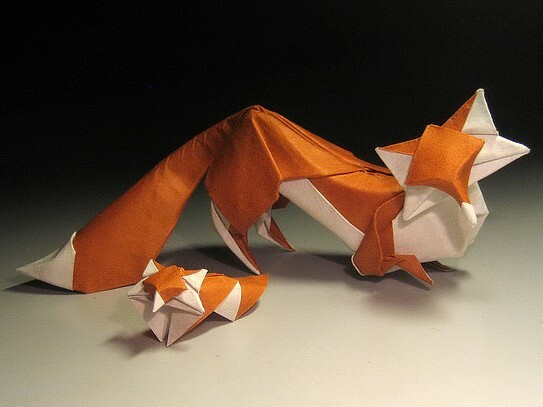 I have never had the patience to do much with origami, but I greatly admire those who are skilled in the art such as Hoang Tien Quyet who designed and built these two foxes in 2009. Each fox is wet folded from a single square of paper that is white on one side and orange on the other. Hoang graciously offers photo folding instructions for the foxes at his Flickr page here. Scrat, the saber-toothed squirrel, has appeared in every Ice Age movie and video game to date. As Scrat's name is never mentioned in the movies, his name is only known from the end credits. This paper model of Scrat was designed and built by DeviantARTist LordBruco. His template may be downloaded here. 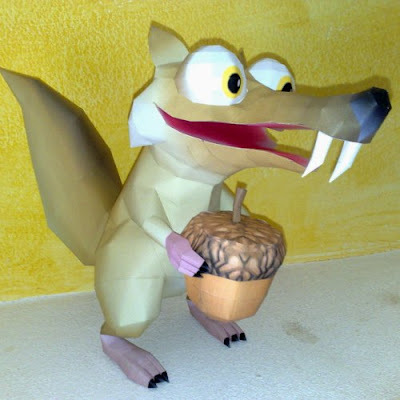 Looking for a more detailed Scrat papercraft? Take a look at this one by my friend Elso. 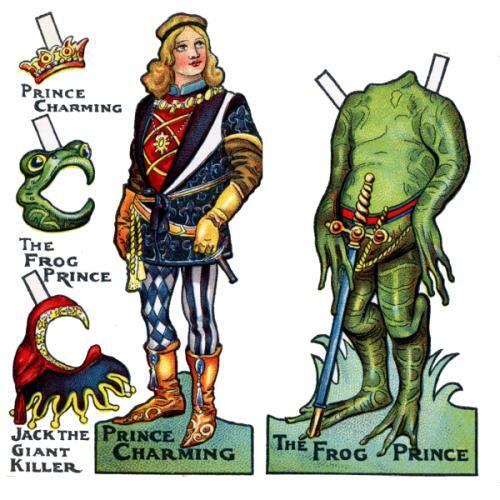 This Prince Charming paper doll is one of several fairy tale characters featured in a postcard series from 1912. The idea is simple: each postcard has one paper doll with two sets of costumes to wear. The costumes allow the doll to transform into an entirely different fairy tale character. So Prince Charming can become the Frog Prince and also Jack the Giant Killer. Six different postcards from the series may be viewed at Dedree Drees Flickr album here.